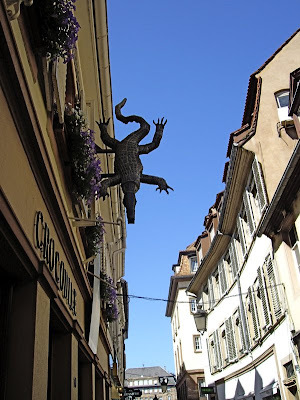 One priority on my next visit to Strasbourg will be to enjoy a meal at Le Crocodile, one of the most famous restaurants in this culinary centre in Eastern France. When standing in front of this gastronomic Mecca last July, my eyes fell on menus displayed in front of the restaurant. They were so intriguing, that I took up my camera and took photo of each menu in order write on them later. 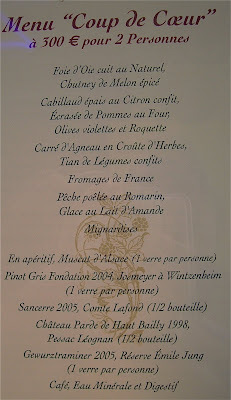 Eating at Le Crocodile does not come cheap, but for €200 - 300 for two you will get a unique culinary experience with wines. In spite of this price tag, it will most probably bring you to the tastes and smells of nirvana. Wonder what they offered in July 2008? Here are the three menus! Goose liver cooked "au Naturel"
If these menus do not make your mouth water, what will? For a collection of such delicatessen, it does not seem too much. Food prepared from the most exquisite ingredients and wines carefully chosen to please the pallet. 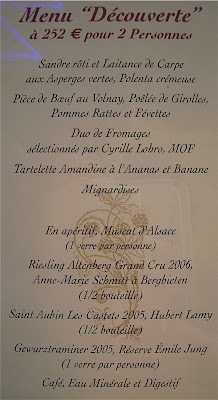 Le Crocodile will be on my list of restaurants to visit on my next trip to the Alsatian capital. Goodbye, Feedburner! Hello Google Analytics!